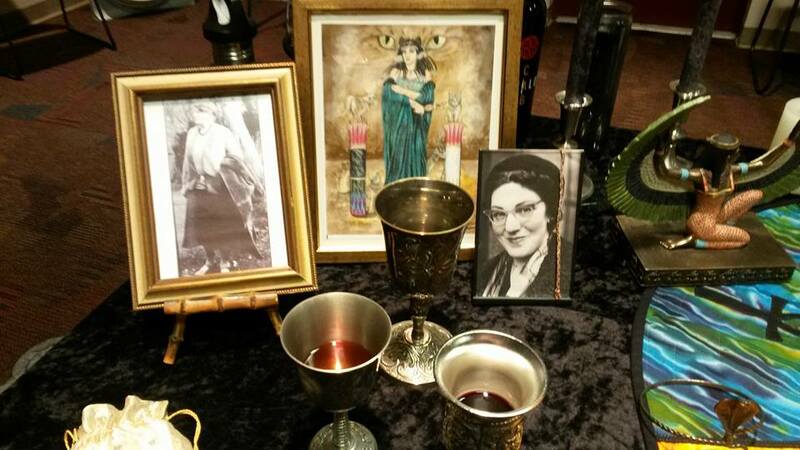 The Spirit’s Edge Shamonial Temple had its in-person Samhain / All Hallows’ Eve Ritual and Salon on Sat., Oct. 29. While this online version is a greatly pared down version of our in-person ritual, though a little more involved than some of our online rituals, it is powerful in its own right and will connect you with the greater working of our Temple. At the time of Samhain, the veil between the worlds thins. The nights continue to grow longer. It is a time of death, of reaping our final harvest of the year, the harvest of meat, as we prepare to enter the darkness of winter. The farmers in Missouri, where our Temple is located, have taken the final crops out of the field. The Crows and Deer and other animals feast, as the hunters come for their own harvest to fill their freezers for winter. You can feel the crispness of the air and taste and smell the scent of Samhain on the autumn breezes as nature stalks its own, like death itself. Yet there is a peace this brings. The idea of “knowing your own death” or “meeting your own death” – Samhain gives us this chance. And once we face this. Once we face our own shadow. Then we can live without fear in our hearts and embrace the present moment with full awareness. We also Samhain have over 600 folks who have “liked” and “followed” our relatively new Spirit’s Edge Shamonial Temple page! In addition, we have almost 500 in our Witches, Shamans, Mages & Pagan Community Meet-up page! If you have not yet joined our online pages, we would love to have you join us! We are undertaking our 3rd Annual Food Drive, benefitting Operation Food Search (to donate, just bring food items to one of our upcoming events through our Yule Ritual on Dec. 17). We also currently have underway our 3rd annual Autumn/Fall Auction & Fundraiser and our most successful yet again this year to benefit our 501c3 efforts! We are about to announce our first Women’s Spirit Circle gathering, and also a women’s shelter drive to go along with it! We plan to hold our first On The Edge Grief Circle in December, starting smaller with it being open to members on our Spirit’s Edge: A Seeker’s Salon page, and then growing. We are also celebrating over six months of a successful and beautiful Healing Spirit Circle providing healing to the community each month! It is so exciting to see all of these plans of community and service coming to fruition! And what better time to celebrate than the Witch’s New Year! 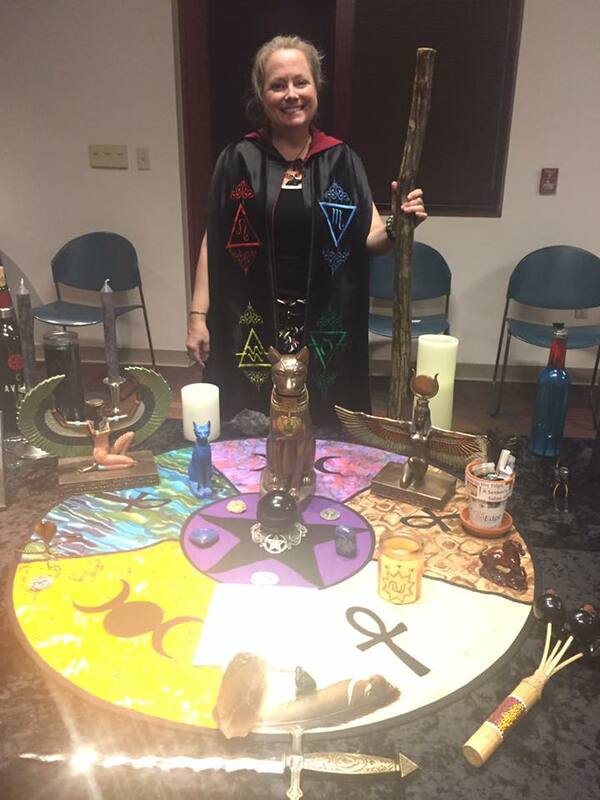 During our Temple’s Samhain ritual, we worked with the Egyptian pantheon – specifically Nepthys, Anubis, Isis, Thoth and Bast. We also partnered with the Hidden Company, the Mighty Dead of our Spirit’s Edge Shamonial Tradition and other Mighty Dead. It was a powerful ritual of honoring our ancestors and communing with the Gods and the Hidden Company. Gorgeous Oak & Sweet Gum coins handcrafted by Alinore Rose from the vision received by Temple HPS Shea Morgan from Anubis; Alinore also made the Eyes of the Spirit’s Edge Shamonial Temple & Tradition’s Sigil from the coins that had natural “eyes” in them – Blessed be! 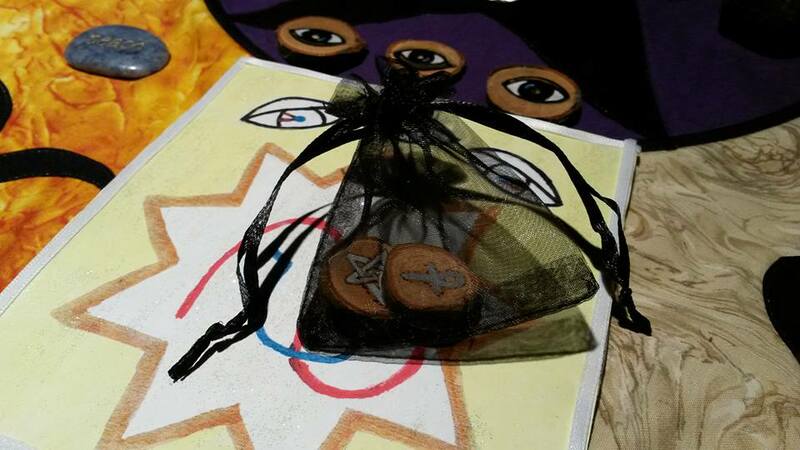 Our members also received a token in remembrance of the working, which was handcrafted by Alinore Rose, making physically manifest a vision received by Shea Morgan from Anubis. They were so beautiful! They were Oak and Sweet Gum coins, which were wood-burned with an Ankh on one side and a Banishing Pentagram of Earth on the other side. They are intended for two purposes: 1) protection and 2) as a meditation/ journey aide. In meditation, either place them on the eyes, hold them in each hand or place one on your third eye and one on your heart while you meditate/journey. We also have offered a few for sale in our annual fall fundraiser on our Spirit’s Edge: A Seeker’s Salon group page – just visit the page and ask to join to check it out! To see all the photos of our altar, the beautiful tokens and more, please visit our Samhain photo album on our Temple’s Facebook page. You are welcome to perform your ritual at any time, but Samhain is often considered sundown October 31 to sundown November 1. 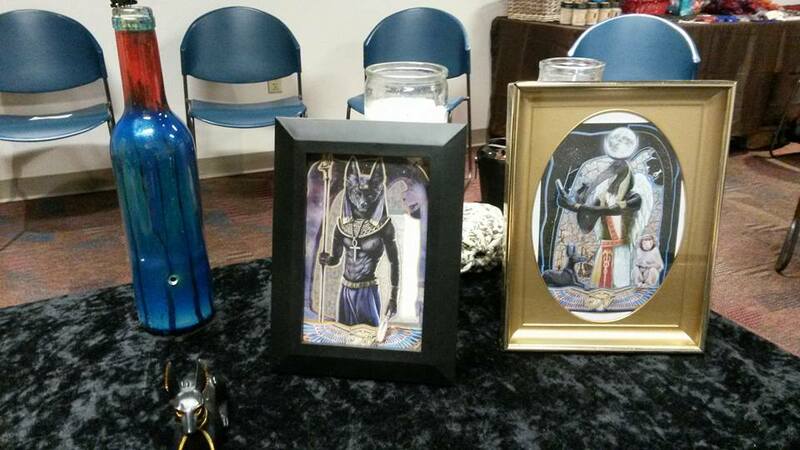 Prepare your altar space with your images of Nepthys & Anubis & Bast and your four candles, and your other items, then prepare yourself and your space according to your preference. You may cast a circle and call the quarters if you would like, but it is not necessary. Hail Nepthys! Goddess of the Evening Sun! We feel the warmth of your love as it casts its light upon us…as that of a thousand evening suns. Oh mighty guardian, guard now the gate. Guide and make safe our path, Oh great Nepthys, as you journey with us tonight. Hail Anubis! Lord of the Sacred Land! Guardian and Protector of the Dead! Oh majestic dog faced god! Black as night and sleek shine of gods! We call on you to lead us where we seek to go tonight. We ask you now and always for your protection and sight. Guide and make safe our path, Oh great Anubis, as you journey with us tonight. Hail Bast! Queen of Cats and Priestess of Witches! Black of night and stalking prey! Hear us now as we call you this day! Guide and make safe our path, Oh great Priestess Bast, as you journey with us tonight. We call to the Hidden Company of the Spirit’s Edge Shamonial Tradition. Join us, walk with us, be with us, commune with us. We call to the Temple of the Twelve Signs. We call to the Council of the Twelve Signs. We call to the Twelve Goddesses. We call to the Twelve Gods. We call to the Twelve Members of the Hidden Company of our Tradition. We call to you to be present here with us. Of the twelve Hidden Company, we further call…Dion Fortune, Aleister Crowley, Gerald Gardner, Doreen Valiente, Agrippa, Copernicus and Black Elk. Be with us tonight. Bring us your messages. Guide and protect us on our path. Be with us, walk with us, commune with us. We also call to the honorable Witches, Shamans and Mages who have walked this path before and we call to their wisdom. This is the time of Samhain. At Samhain we remember those who have crossed the veil before us. Ancestors of our blood and also those of our tradition and path. The Witches, Shamans and Mages who have walked this path before. If we have the courage, we can see beyond the veil, beyond the waters of the sea of the dead. What does the time of Samhain mean to you? What do you see of the cycle of death, life and rebirth in your life? What changes have you made in this past year? What transformations do you wish to make in this next year? What no longer serves you? Of what can you gently let go? Letting go of things that no longer serves provides fertilizer for the seeds we plant for new growth come spring. What seeds do you wish to plant now for harvest in the spring? Take your divination system. Have your pen/paper/journal handy. Draw one card or rune for each of the 12 months of the next year – for Nov. 2016 through Oct. 2017. During the year, you may place the card or rune for each month on your altar and meditate on that card or rune for its messages for you that month. In ritual work, we make an Act of Power and we build that power to fuel the Work. This is a chant by Doreen Valiente from her book Witchcraft for Tomorrow. You may use a rattle or drum. You may dance in place or around your circle or simply sit. Chant this three times through (more if you prefer) in the way that speaks to you. It was not set to music and was intended to be chanted. At this time you may choose to speak words of love and gratitude to Nepthys, Anubis, Bast and the Hidden Company. When you feel you are finished, thank the spirits for their presence in your space and wish them farewell. Then close your circle according to your own tradition. Take your offering and make it outside somewhere in nature. May blessings come to you and yours in this Witch’s New Year! Blessed Samhain! Blessed be! Thank you for joining our Spirit’s Edge Shamonial Temple’s Samhain Ritual! 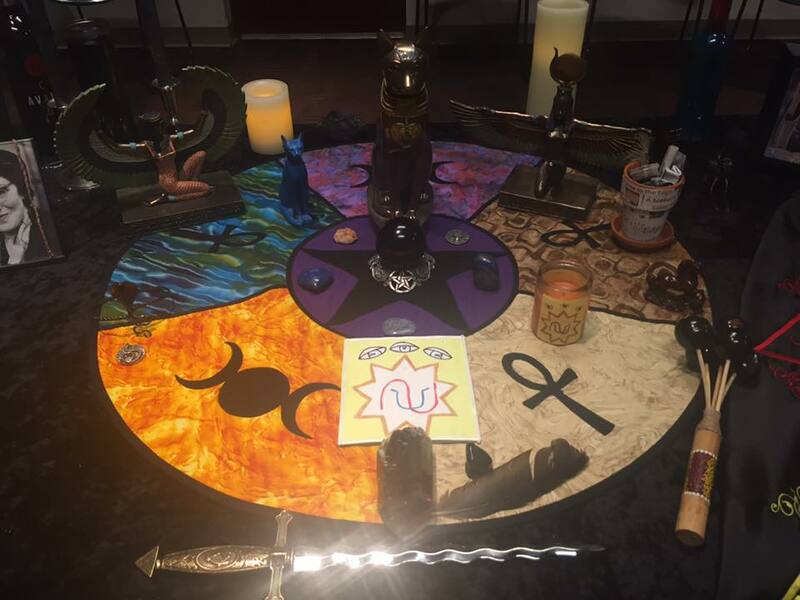 We happily encourage you to post photos of your working to share the love of Samhain on our Facebook pages – Spirit’s Edge Shamonial Temple (and “like” and “follow” us there!) and Spirit’s Edge: A Seeker’s Salon (All are welcome to join!). For more information on all of our offerings, you may check out our Facebook pages and also our Spirit’s Edge website. This ritual was written by Temple High Priestess Shea Morgan, unless noted otherwise, and all rights are reserved. It may be used for your personal use only. If you wish to use this or a variation for a group in the future, please contact Shea Morgan for the Spirit’s Edge Shamonial Temple at ravins52252@mypacks.net; this ritual may not be published or used publicly elsewhere without prior written permission and attribution.